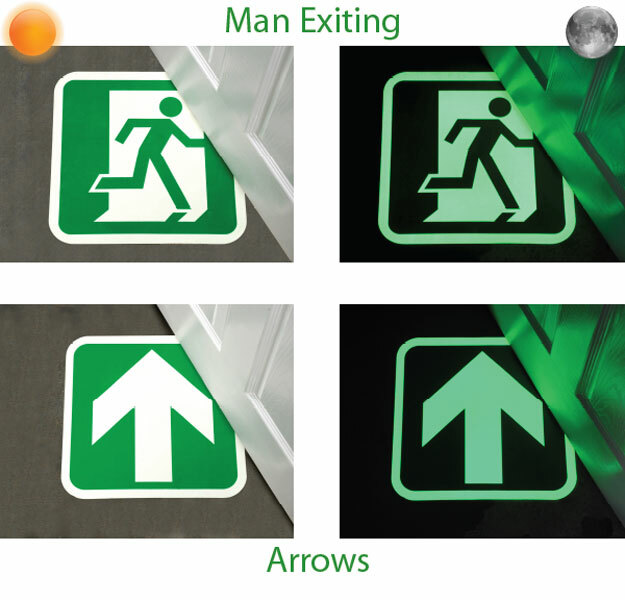 Fabufacture supplies a range of glow in the dark directional floor signs to indicate exits in times of power outs and fires. Vibrant green and white during the day, they will charge through natural or artificial light, and in a lights out situation they will glow to indicate exit routes. Our directional floor signs are manufactured from PVC, with a laminated surface to prevent print scuffs, making them extremely durable. They come with a permanent adhesive backing that, whilst offering a strong bonding, will not be too much of a struggle to remove if required. Compared to stencilling, masking and painting, with waits in-between for drying times, Fabufacture’s alternative is a one piece, adhesive application, that takes literally minutes to apply, and can be used immediately, complete with an industry standard anti-slip surface.